Disney Pixar's animated blockbuster Brave was chosen to launch Dolby's latest cinema sound format, Dolby Atmos. The revolutionary new audio system, which had its public debut in the US in June 2012, introduces a ceiling array to the traditional surround speaker configuration and allows object-based sound design for the first time. Dolby describes the end result as the "illusion of an infinite number of speakers." The choice of movie title seems serendipitous. Dolby's gamble on Atmos looks certain to make it the front runner in what is shaping up to be the most hotly contested evolution in cine-sonics since the advent of 5.1. Four other companies (Barco, Immsound, Iosono and Illusonic 3D) have rival immersive audio solutions at various stages of development, all intended to complement the higher picture quality now being offered by 4K digital cinemas. The stakes are high. The winner of this new surround sound format war could potentially dominate big screen audio for a generation, making $millions from studios, exhibitors and ultimately home video licensing. Stephen Field is the senior vice president for programs and products at Datasat Digital Entertainment (formerly DTS Digital Sound). He's more familiar than most with the next generation of 3D sound formats. Datasat makes the AP20 cinema sound processor, used in theatres worldwide, and has just launched a new high-end home cinema processor based on it, called the RS20i (yours for a cool £16k). He told Tech Radar that systems such as Dolby Atmos not only change the way films are experienced, but fundamentally alter the way sound designers think about mixing movies. ''Suddenly every element in the frame becomes a separate sound object," he says "and the resulting soundtrack gets mixed on the fly at each and every cinema, depending on the speaker configuration in the theatre. "If you have a hundred speakers down one wall, you can have the sound come from the exact speaker specified by the movie's sound designer. If that speaker fails, or you have far fewer speakers in an auditorium, then the system calculates where it needs to create a phantom speaker, so that the sound still appears in roughly the same space." The process is called adaptive rendering. Dolby Atmos achieves this immersive innovation by combining additional sound channels with object based steering. Engineers can place an audio object anywhere spatially, with a precision impossible in conventional 5.1 mixes. The result is a more natural and immersive soundfield; the days of crude overhead pans are audio history. Academy Award winning director Brad Bird was given a preview of Dolby Atmos earlier this year. He excitedly tweeted afterwards: "Was given a demo @ Dolby today of sequences from INCREDIBLES & MI:GP remixed in their brand new top secret system. KILLER." However, equipping a cinema for immersive audio is an expensive business. 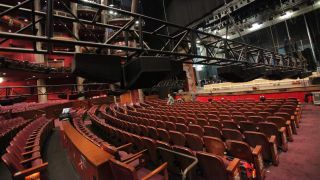 A Dolby Atmos theatre employs two additional overhead speaker arrays, running front to back, which are used to create height effects. There are also additional surround speakers added to the sidewalls, with enclosures taken much closer to the screen than has been the norm previously. However audio elements are not locked to any of these channels. Instead, they are stored with virtual position metadata and are assigned positions dynamically during playback, depending on the arrangement within a given theatre. Of course, not everyone agrees this is the best technology solution for better surround sound.